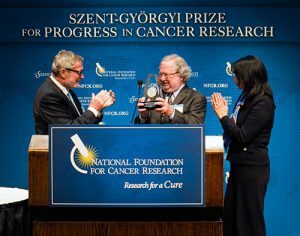 The 2014 annual winner of the Szent-Györgyi Prize was James Allison, Ph.D., Professor and Chair of the Department of Immunology and Director of the Immunology Platform at the University of Texas MD Anderson Cancer Center in Houston, TX. Recently named by Time Magazine as one of the 100 Most Influential People, Dr. Allison’s pioneering cancer research has led to the successful development of a new class of immunotherapy agents known as “checkpoint inhibitors” and the first FDA-approved drug (ipilimumab or Yervoy®) for the treatment of metastatic melanoma. Immune checkpoint inhibitors are drugs – often made of antibodies – that prevent immune cells from being turned off by cancer cells. Instead of attacking cancer cells directly, checkpoint inhibitors unleash the body’s own T cells—the soldiers of the immune system—to fight malignancies. Without the presence of these drugs, tumors are able to press on the “brakes” on the surface of T cells—these brakes are known as checkpoints—that halt the body’s immune response in its tracks. Checkpoint inhibitors disable these brakes, allowing T cells to sustain an attack against the tumors. For decades, scientists tried to find ways to train the immune system to attack tumors in the same way that it attacks bacteria or viruses. But since cancerous cells are born from normal cells, that seemed an impossible task. It was Dr. Allison who figured out how to switch immune cells on to target malignant tumors. In the early 1980’s, Dr. Allison was one of the first to show that a protein receptor on T cells, the enforcers of the immune system, acts as a checkpoint to shut down immune response. In 1992, he showed that a molecule called CD28 functions as the T cell’s gas pedal, and in 1995, he identified the T cell’s brakes. This led to his development of ipilimumb in 2011. An antibody that targets CTLA-4, ipilimumb blocks the breaks and unleashes a strong immune response, opening an entirely new, transformative approach to treating cancer. Immune checkpoint blockades are now approved for some late stage cancers and hundreds of clinical trials are underway for testing the treatment efficacy of the drugs in earlier stages of these diseases and against other cancers. Checkpoint inhibitors are the most important advance against cancer since chemotherapy. Dr. Allison’s research directly led to the development of ipilimumab- the first drug to significantly extend survival for patients with late-stage melanoma. 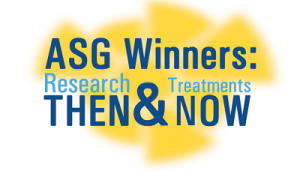 Prior to this discovery, the median survival of patients of metastatic melanoma was 11 months. In 2014, a retrospective study of 5,000 patients treated with ipilimumab showed that 22% were still alive after 10 years. Other advanced cancers of the lung, kidney and bladder have also shown to respond well to this therapy. Fast forward to today, the FDA has now approved three second-generation checkpoint inhibitors and two other arms of immunotherapy—cancer vaccines and a therapeutic approach known as adoptive T cell transfer, in which a patient’s own T cells are engineered outside the body and reinjected into the bloodstream.